Create an easy personalized gift by entering a message, name, or inside joke of your choice! We'll engrave it above the squiggle design. Please also take a look at the image with our 8 standard fonts. In your order details, let us know what font you would like used for the text. If no font is selected, we will proceed with Futura. 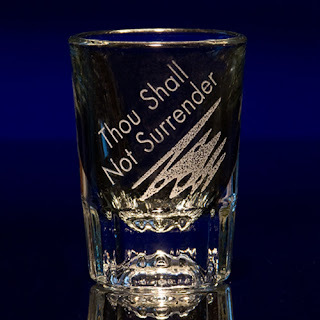 GlassWithaTwist.com was founded in 2007, and quickly has become the web's best source for custom engraved and screen printed glassware. We moved to our current location in Reno, Nevada in 2009. Our small company is comprised of a talented and dedicated staff who produce all of our customized products in-house. We enjoy what we do, and are pleased to provide you with distinctive and unique designs for your custom glassware needs. We are proud to offer sandblasting, which is the industry's premier engraving method, as well as multi-color screen printing. We only use restaurant quality glassware. We allow complete flexibility in our designs, and we can do orders all the way down to a single engraved glass. Our products are uniquely suited to be original and special gifts for your friends or family. Our attention to detail and our design flexibility make us a great resource for creating wonderful, personalized gifts for the special people in your life. Our engraved offerings are ideal for gifts, as we can produce them in any quantity that you desire. We pride ourselves on personal, friendly service provided by a knowledgeable and courteous staff. If you have specific questions, or would like guidance on creating a personalized engraving or printing for a special order, we are happy to help. From the moment you place your order, our customer service, production, and shipping specialists will handle your order with care and precision. We are delighted to offer you excellent service and products....whether your order is for one glass, or one thousand! This is a larger shot glass and I had Life of a Mad Typer Etched into it. I got it with the idea of doing watermarbles in it. I am not a drinker you see but I do watermarble a lot. I think these are great for gifts to put peoples names or their business names on them. Beautiful shot glasses to give someone as gift. 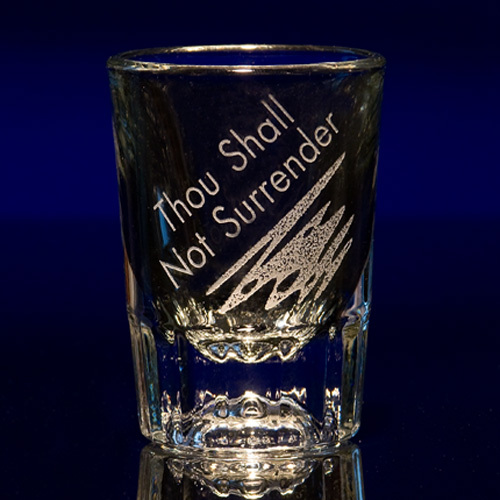 I found some beautiful customized shot glasses at http://www.personalizedglassengraving.com in affordable price. I love your blog name on that glass! So cool!